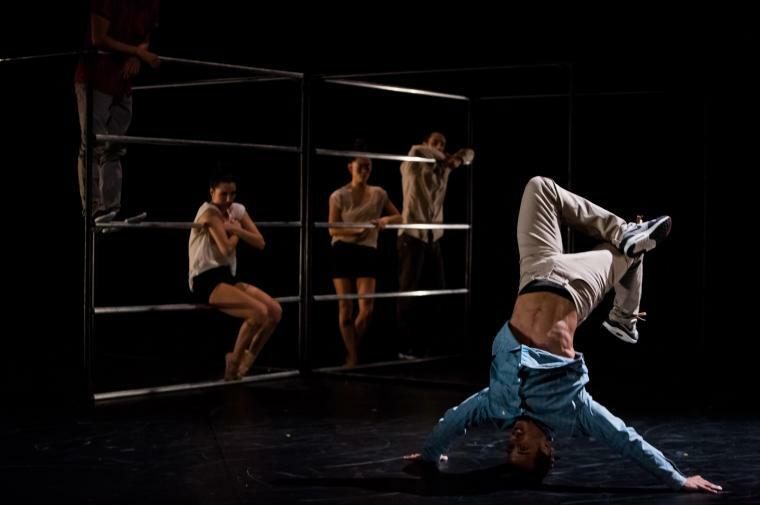 Giant cubes, gravity defying rigging, and an amazing fusion of contemporary and street dance: the six artists of Company Wang Ramirez were physically virtuosic and emotionally intense. Swiftly moving from daring breakdance solos to nuanced contemporary duets and layered group sequences, there was an abundance of information to unpack in each segment. A voiceover talked of democracy, capitalism, and inequality during Sebastien Ramirez’s emotionally dense solo. Another highlight was a duet between Honji Wang and Johanna Faye. They stalked around the stage in extremely high heels, leaning back with their hips leading the way. Their manoeuvres, including hand stands, were impressive and striking and they got many laughs due to the exaggerated strutting and absurdity if it all. Most unique was the rigging which allowed the dancers to float as if in zero gravity and move at varying speeds to suddenly fly over one another or softly land on top of one of the cubes. The control, trust, and teamwork necessary for these sequences is immense as rigger Alister Mazzotti controlled the rope and pulley system to lift the dancers in harnesses at just the right moment and at just the right speed. Poetic, political, and full of acrobatic and subtle movements, Borderline is a stunning work that lives on the border between chaos and control; agency and fate; and staying grounded and drifting away. Addressing the crowd, one of the dancers told us about an experiment that was done with three bowls of rice showing that water reacts to sound and energies. The bowl that was told “I Love you” lasted much longer than the one that was told “I hate you,” and the bowl that was ignored went bad the quickest. “We are made of 80% water! Understand?” he implored. If there’s truth to this idea of positive energy having that much of an influence, then I’m sure the energy coming off the stage did us a world of good in the audience. The whole theatre was out of their seats cheering as the company performed playful mini solos and left us wanting more.